So I finally gave in. Two and a half weeks ago. After what seems like ages, we once again have cable. I don't actually remember how long it's been since the last time we had it or a dish or anything of that sort, which in itself means it's been a long time. I'm thinking around eight years. Wow! It's not like I've been in the dark...I have a computer, after all. We'll catch some of the vast world of television at a hotel or one of my many family members homes...because they can't do without...but that's been the extent. I actually like renting whole seasons of shows I've missed and watching them in one fell swoop. No commercials...back to back episodes...no waiting. Actually I'll continue to do that since I drew the line at premium channels. Dexter, Weeds, True Blood...I actively work to avoid their story lines until the next season is released...so don't you dare say anything. One channel I am truly head over heels for, though. The Cooking Channel. That wasn't around last time we had cable. Sure, I like Food Network...but it's the Cooking Channel I always find myself watching. And DVRing. Don't even get me started on DVR. Heaven! Many new celebrity chefs have emerged since I last had the ability to sit and check them out. But in all honesty, my favorites remain unchanged. You all know that Rick is my favorite. Right? Unfortunately he's not on either channel. Lidia is right up there, as well. She's not on either channel. Ugh. But fortunately I can still watch Jamie and Nigella and Julia (thank you, Cooking Channel). But I can SHOUT with no qualms that I have a new favorite to add to my list. Thanks to somebody who introduced me to him before I even knew I'd be able to watch him every week...and somebody else who reminded me of that introduction after I actually was able to watch him every week. Friends rock...always looking out for you... He's tattooed and extremely adorable. He's awesome in the kitchen and he's full of passion. Beauty. 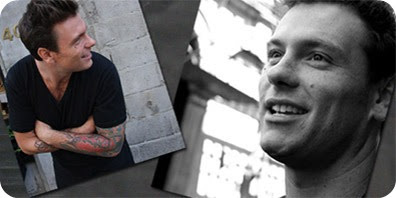 I canNOT get enough Chuck Hughes. Do you watch Chuck's Day Off? Major Crush. I can't help going a bit ga-ga over that Canadian accent and adorable smile...especially when it's only the icing on the cake. The he's-an-amazing-chef cake. His love for food and the people he feeds is the biggest turn on. I wanted to make absolutely everything he made on his Beer Show...and I will...but I started with dessert. Can you blame me? 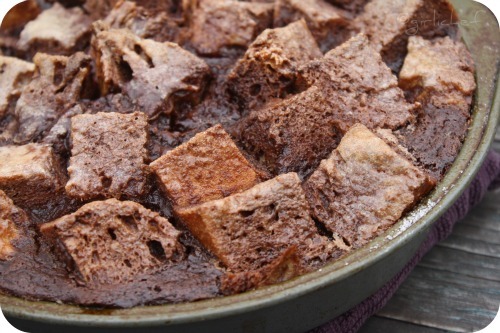 Bring the Stout, cream, and ½ c. of the sugar, to a simmer in a medium saucepan, stirring until the sugar dissolves. Remove from the heat. Add 1 c. of the chocolate chips and whisk until melted and smooth. Set aside to cool. Add the bread cubes and the remaining chocolate chips to the custard, and toss to coat. Transfer to 1½-quart shallow, greased baking dish. The batter should come close to the top of the pan. Sprinkle 2 tablespoons sugar over top. Bake until the custard thickens and center is just set, about 50 - 60 minutes. 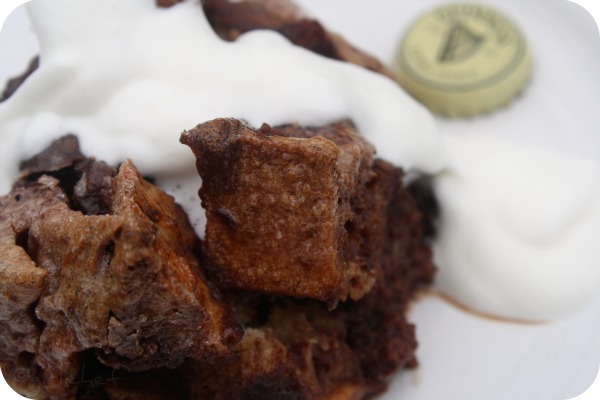 You can see this is basically a bread pudding...it's rich and complex and delicious! The lightly sweetened cream is a necessity since the cake itself is so...well...deep for lack of a better word. Sheer indulgence. And YES, you CAN taste the Stout. I knew it would happen. I've grown to love having cable again. Perhaps that's why I put off getting again for such a long time. That and the price. Now I don't know if I'd be able to give it up...without major withdrawal, that is. oh man oh man...yes I've been watching him, too! He was making a breakfast tortilla the other day that just looked FABULOUS. Even the hubs thought so. We are cableless, but if I had it, I would watch for him! Count me in on the cake however, it looks like something I will love. Good thing for me, Honey does not like bread puddings and He does not like beer. Allmine, allmine, alllmine! I am in your camp regarding the whole season at a time, love to do that. He is freaking adorable, that looks freaking delicious, and it's way too freaking early for me to be drooling on the keyboard! You are evil. p.s. The husband and I were THRILLED that Sam Adams replaced Cranberry Lambic with Chocolate Stout in the Winter Sampler. Not that I can drink any, but still! Looks rich and tasty. 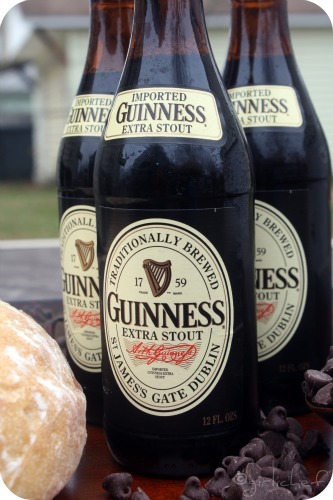 One stout for the cake...one stout for the baker...yes yes. Beth...YES! The one with the smoked fish in it...drool!! Everything he makes I want! I did not see any quantity for the chocolate chips. Could you please clarify? thanks. Yea he is a HOTTIE and your cake looks yummy and True Blood is the BEST! Ha! Cake made with beer? How interesting! It looks SO good! First, lets talk about the cable, :). We cut out from cable more than a year ago and don't really miss it. As you said internet can be a good replacement. Now to the recipe, is it very ingenious and I for sure will have to make. let me tell you that I already have all the ingredients for the pasta with italian sausages you posted last week. I cook something similar but got to try with the extra fennel seeds. I had seen that Rick Bayless is one of your favorite chefs. Have you every read Diana Kennedy's book? She is the "Maestra" , the highest authority on Authentic Mexican cooking, her books besides having recipes also have good stories. Another good Mexican cookbook author: Patricia Quintana. Now, let me go to the store an buy a beer. I have a good excuse. I am making dessert with it! Saludos y que pasen un feliz Dia de Gracias! This looks fabulous -- a must-try for me. Thanks, Heather! I am drooling. Not sure whether it's because of that cake or because of that beautiful specimen of a chef that you've featured. Probably both. 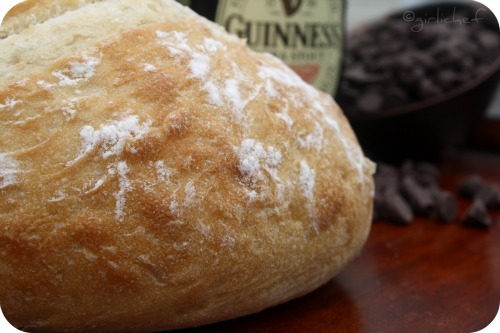 Love baking with guinness. Love it. The Cooking Channel is extra $$ here... sigh. Cable is expensive enough. Sigh. Now that chocolate cake with stout yet - oh how sweet that is. Happy Thanksgiving to you and yours. All I want for Christmas is this chocolate stout cake. Oh em gee! It looks amazing. You are inspirational. I have a major crush on Chuck too. I think his show is my new favorite. I love that his passion and personality come through in the show. He seems to have a very thoughtful and generous nature. Plus, you gotta love those foodie tattoos. And, don't forget about the music. Wish there was a soundtrack for the music on his show - ha! I'm glad to hear that you like him. I had a feeling he would win you over. Love the cake with the stout. It looks gorgeous with the cream pouring down all over it. I almost forgot...let's just talk about True Blood for a minute. Can I just say that I love that show? I think it's probably my favorite show ever. I wish I could wait and watch the whole season at once, but I just have no willpower when it comes to that show. I'm almost embarrassed to say that I've even been known to hop on a true blood forum here and there. I'm addicted! I wish I had a piece of that right now! :) Now I know I'm not the only one who prefers to see Dexter seasons all in one go (although someone blew the finale for me last season, grrrr). 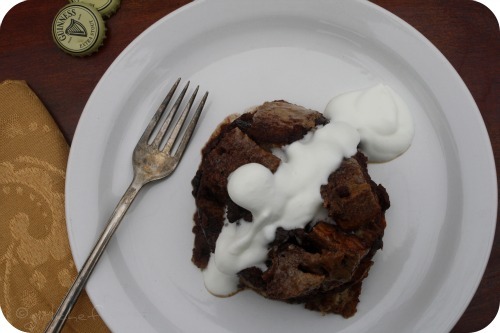 Love the idea of twisting up bread pudding. You could really take that in a zillion directions. Thanks for being such a great host for the Hearth and Soul hop! Wow - chocolate stout cake - sounds heavenly! We don't get cooking channel up here - I hope they bring it up! We have food network canada - which is a different line-up. Lots of Canadians on it. And Chuck, of course! I am with you on renting the seasons too - I have got to see the rest of True Blood and Dexter. We have only aired season one of TB and 2 of Dex here on regular cable. Major withdrawal! We recently had a cable free period. I found myself watching way too many documentaries which got really depressing really fast. That cake looks so interesting and yummy! We have been "cable free" for about two years, but I miss it...and I know that we will cave in eventually! I would love to be watching food network right now! Your chocolate stout cake looks INCREDIBLE. What a lovely way to use two great ingredients. I hope you have a beautiful and blessed rest of your week! This looks delicious! I LOVE True Blood. Funny, I am JUST getting rid of cable. I love bread pudding. Chuck is definitely cute. I'm dying to try some of his recipes. Oooh, we got rid of cable, and I really miss cooking shows. This dessert looks aawesome. 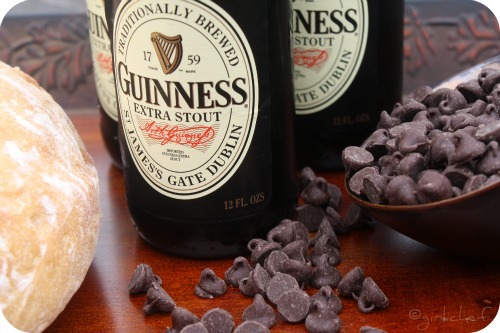 I love the combo of chocolate and stout. 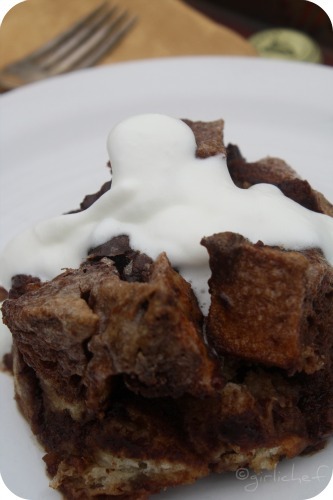 I haven't seen this done bread pudding style...I'm all over this! Thanks for sharing. ah, I love the Cooking Channel! It has way better personalities and shows than the Food Network. Love! I don't get to watch him often - my husband hates cooking shows and we only have one TV with cable. That said I love the show. You were certainly inspired with this amazing dish - yum!!! thanks chica for being an awesome hostess of the Hearth and Soul Hop - wishing you a fabulous Thanksgiving!! cable is great and dvr is really necessary :) Your chocolate stout cake looks and sounds spectacular! Wow! the stout cake looks exotic and delicious. If I don't "see" you tomorrow....Happy Thanksgiving!! Cheers my fellow Sista Lush! Heather....you are truly a woman after my own heart! Chocolate AND beer put together to make a cake...Oh yesss! I cannot wait to try this one!!! Thanks for being a fantabulous host with the Hearth and Soul hop. this looks great!!! 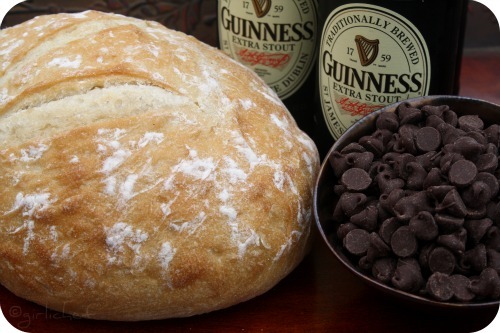 and made with guinness& chocolate, even better--thanks for stopping by as well and hosting the blog party....! Happy Thanksgiving.cook up a storm! We don't have the Cooking Channel but we do have Chick Hughes on iur Canadian Food Network. He is one hunky Canadian from Montreal. Good Lord that looks amazing, Heather. That looks so good to me right now! I know what you mean about tv. I got tv about a year ago after being without it for about fifteen years. For the longest time I didn't even tell anybody because I felt so guilty about it. :P I do enjoy the Cooking Channel along with Food Network though. I have enjoyed the Cooking Channel, it's more like the old Food Network, back when Emeril and Molto cooked from small studio kitchens. Back when talent was the focus, not personalities. I don't have a thing for Chuck but every time Nigella is on, I'm like a school boy with a crush. I've never even heard of him but I like him! The best icecream I have ever had was guinness flavoured, so I know this pudding would be lovely. I don't even have a TV, so I know what you mean about the things that you miss out on. I just wanted to let you know that I made this cake, with some slight variations since I already had the bread pudding mix in the freezer but it came out great. My family loved it.